“You wouldn't let your child smoke” - reads the tagline on a hoarding put up by the People for the Ethical Treatment of Animals (PETA) in Kochi on April 7. However, it's not that extra large font that gains people's attention. It's definitely the striking photo of a kid smoking cigarette, that has been meticulously positioned on the right side of the flex board. The following caption in comparatively small fonts reads: “Like smoking, eating meat increases the risk of heart disease and cancer. Go vegan.” The advertisement might have targeted an adult audience, but its field of influence would definitely encompass the kids, too—not because of the magnanimity of those words, but because of the gravity of that picture. Children are generally curious to know things, and it is common that they try to imitate anything which they see or hear. So what message might this advertisement, which has been put up at a busy intersection near a residential area of the city, convey to a kid who happens to see it? At those tender ages, where they are still not able to read and understand what is written, it would be the pictures that influence them the most. 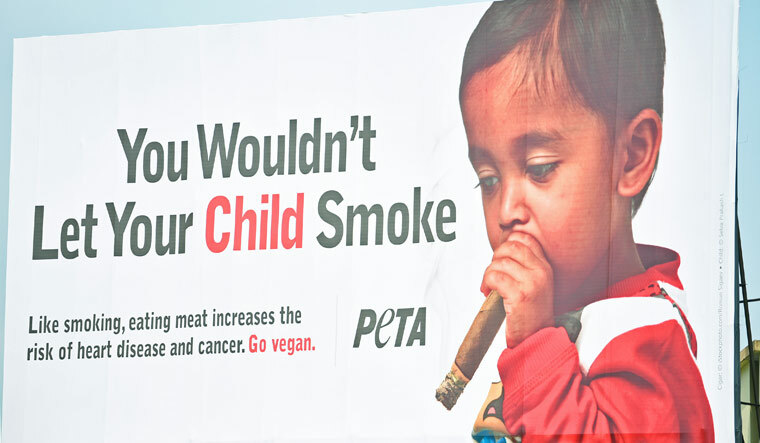 And here, unfortunately, PETA has chosen the photograph of an innocent kid—apparently even less than seven years of age—with a cigarette stub on his mouth to promote vegetarianism. PETA's advertisement came at a time when there are strict restrictions on exhibiting scenes of smoking or using other tobacco products even in films. Besides its controversial design, the choice of language on the hoarding also seems to be in question. The intended message of the advert that the non-veg food is as harmful as smoking could be fully grasped only by those who know English. But in a tier-2 city like Kochi, where people from even remote areas—who are familiar only with their local language—come for jobs or other purposes, everybody is not expected to read and understand English. So, how does this advertisement communicate with them? The government has been doing enough campaign against tobacco products. It's noteworthy that enough care is taken in each of the advertisement boards and hoardings that they put up in places where people usually gather in large number. However, in this case, PETA's advertisement misdirects people in two ways. 1) They publicly show a minor boy smoking. 2) They claim non-veg food is as harmful as smoking. The second one can be overlooked given that it is an advertisement, but the first one is a terrible mistake. The opinions expressed in this article are those of the author and do not purport to reflect the opinions or views of THE WEEK.